ABC Remix: Music Theory and Tracing Pages: Oh My! 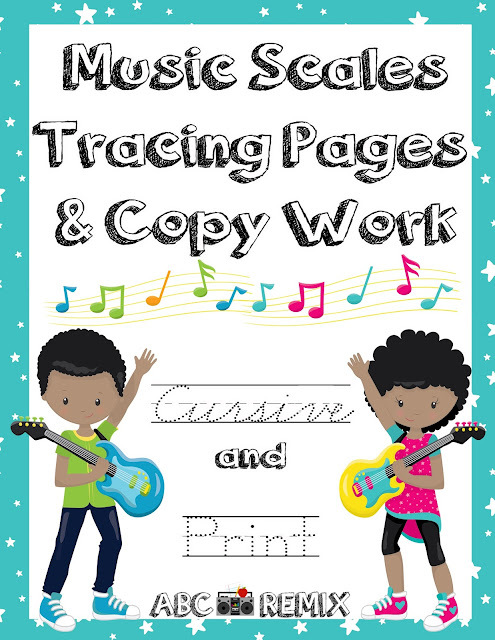 Music Theory and Tracing Pages: Oh My! One of the things I get frustrated with as a parent are tracing books. You know those books that teach young children in Preschool and Kindergarten how to write letters and words? Well they all have one thing in common: they are catered to the non or beginning reader. The idea is that by practicing to write simple sight words and phonics blends, you will become a better reader. But what if you are learning to write at a time when you are reading several levels above grade level. Does writing "ch" or "the" serve your reading skills? Also does tracing the number 2 while identifying two apples serve your math skills if you are working on 4th grade math? While I understand that many children learn to read and write around the same time, that has not been true for my children. So my search for tracing book sand tracing pages that served the needs of my child resulted in nothing. That is why I am on a mission to create begging level writing pages that help students learn across the curriculum in the arts as well as advanced core academic subjects. Please check out the first of my products.